What is your OSM Rank ? : Neis One! What is your OSM Rank ? 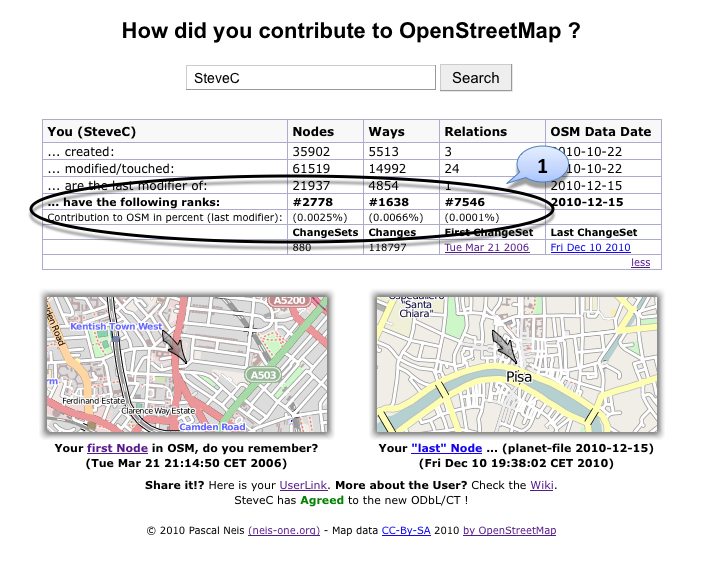 And again, I did a small update to “How did you contribute to OpenStreetMap ?” (http://hdyc.neis-one.org). You can now see your ranks within the OSM World, depending on how you have been contributing to the project! Besides the regular OSM data update, implemented by applying the planet- & changeset-dump (dated 2010-12-15), I also added two additional rows with some information about your data. In the picture below you can see your rank in OpenStreetMap (1) separated by different OSM objects such as Nodes, Ways or Relations. The rank refers to the amount of objects that have been lastly modified by you (see also row: “… are the last modifier of:”). The percentage in the brackets gives you an impression of how big your contribution to the project has been so far in comparison to the whole OSM database. *Remember: Not every member of the OSM project, which are currently more then 330000, has contributed! I believe that prominently publishing a mapper’s “rank” is not a good idea. 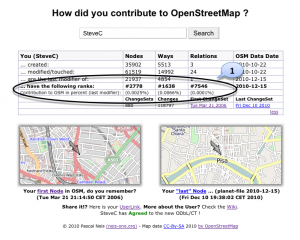 The rank doesn’t reflect the worth of a mapper’s contributions to OSM. Of course, the other stats don’t have much to do with that, either, but the difference is that a “rank” strongly implies a value judgement. Any ranking that will be negatively affected by valuable actions (such recruiting another mapper in your area, who will of course touch some of “your” ways) is counterproductive. You are not the first, but your service is the more attractive and user-friendly than the alternatives. This means that it will have a more noticeable effect. * A mapper doesn’t care about his/her rank. Then it has no negative effect, but the mapper will not be motivated to contribute more to OSM because of the rank either. * A mapper does care about his/her rank. Then it has the potential to be a positive motivator. However, as there are clearly situations where a more productive course of action will be less favorable for one’s rank than an otherwise less desirable alternative, it will at least sometimes be an incentive for the mapper to make the wrong choice. Of course, I expect that most mappers will be able to avoid being influenced by that effect, at least consciously. But (even partially) replacing the “natural” motivation of creating a good product with that of scoring a high numerical ranking is risky. It doesn’t even matter that much what the ranking represents – whether it’s modified objects or created objects in OSM, lines of code or man-hours in software development … the problems are similar with all those metrics if they are used to judge an individual’s performance. Could you please update the dataset for the created and modified numbers? As of now I have created about 7000 nodes, modified about 5000 nodes and I am the last modifier of 40 000 nodes. It’s quite bizarre to see this. ranks are important to keep people motivated. OSM could do more in that regard and would gain more contributions. This whole “gamification” thing is hot right now and a bit of a buzzword, but if sone right if could help the project.